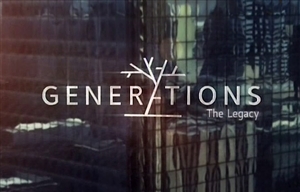 Generations is a South African television soap opera created by Mfundi Vundla which revolves around the large and multi-generational Moroka family, which is the centre from which various story lines emerge. The welfare and survival of this family is a vehicle for the conflict and contrast, and serves as the fire that fuels the drama between two social factions. The series premiered on CCV-TV (the forerunner to SABC1) on Friday 4 February 1994, at 21h05. Set in the cutthroat world of media communications in the city of Johannesburg, Generations looks at the story of the Moroka Family, all of whom have passed on and left their legacy to the only surviving member, Karabo Moroka. Karabo, a model and hair salon owner is now faced with the daunting task of taking over the reins left by her father and brother, Archie Moroka, to head up New Horizons, their advertising company. Faced with a huge responsibility of owning an advertising company, Karabo enlists the help of Tau Mogale, a powerful man in his own right and together they become partners in New Horizons. The two eventually fall head over heels in love but their relationship has to endure many obstacles which continually tear them apart. Unable to handle the pressures set by powerful media mogul Sibusiso Dlomo of Afri-Media, Karabo eventually gets Busi Dlomo to join forces with her and together they become partners in a broader media empire known as Ezweni Communications. Karabo and Busi, together with quirky sister-in-law Queen Moroka and assistants Ntombi Khumalo and Cleo Khuzwayo, have to overcome the odds in a man's world as they take on the powerful Sibusiso Dlomo and the very dangerous Jack Mabaso. The men will stop at nothing to get their share of Ezweni even if it means resorting to violence, seduction and even murder. Quietly in the Ezweni offices is Anne de Villiers, the shrewdest and calculating villain yet. She's ready to tackle Sibusiso and Jack head on and she will stop at nothing to get her hands on Ezweni. Drama, suspense and intrigue are the name of the game when you're up against enemies you don't even know you have. Will Anne succeed in her thirst for power and complete control and will the women of Ezweni succumb to the pressures of the media world? Smanga is trending for all the wrong reasons! Tshidi wants revenge! Also: Sphe wants honesty but isn't getting what she wants.